Where Do You Go When The State Legislature Says "NO"? 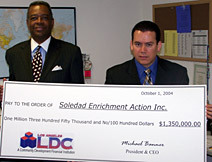 Soledad Enrichment Action Inc. (S.E.A) is a community based organization founded in 1972 by Brother Modesto Leon, S.E.A's executive director and concerned mothers in East Los Angeles whose sons were victims of gang violence. The centerpiece of the organization is its alternative charter high school for at-risk youth, operating at 17 sites throughout Los Angeles. The school is located in a particularly distressed high poverty census tract with a 27% poverty rate and a minority percentage of 89.7%. Reliant on public funding, when the California state budget was delayed, SEA needed capital fast to bridge their current funding gap. SEA needs to use the equity in the property to meet a working capital-cash flow deficit caused by the delay in the annual reimbursements of cost due from LACOE. The amount of reimbursements covers three fiscal years. The purpose of this loan was to provide the organization a loan which will bridge the funding gap from the delay in approval of the California State budget. The LA County Office of Education funds SEA under its Charter School program. This also allows the primary source to restructure the SEA eligible real estate debt use for acquisition or renovation into tax exempt bond issue which the LDC will place with investors. SEA will continue to operate its 17 sites, servicing an area that has come to rely on its programs for youth.